In this intensely woven tale, Gaude’s use of language prompts the comparisons between events that are centuries apart. Just as I gained purchase at the macro level, Gaude would juxtapose a minute detail which, under scrutiny, slightly turned all that I was thinking. A complex contemplation that leaves both the characters and the reader with a provocative and absorbing question which immediately changed my perception of my life. Wonderful! 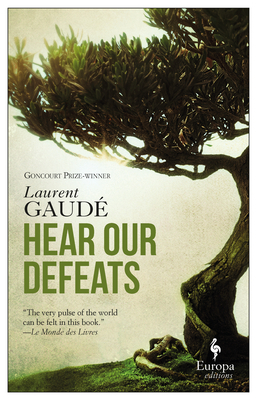 Timely and provocative, Hear Our Defeats is a novel about the battles that define us. The battles lost, won, and those still being fought. A French intelligence officer, Assem, is tasked with tracking down a former member of the U.S. Special Forces suspected of drug trafficking during the War in Afghanistan. En route to Beirut he shares a night with Miriam, an Iraqi archaeologist, who is in a race against time to save ancient artifacts across the Middle East from the destruction wreaked by ISIS. Woven into these two forceful, gripping storylines are stylish meditations on humankind's bellicose history: Hannibal's failed march on Rome and the burning of his fleet on the waters of the Mediterranean; Grant's pursuit of the Confederates into rural Virginia; Robert E. Lee's surrender at Appomattox Courthouse; and Emperor Haile Selassie's swift retreat from Ethiopia. All turning points in world history, each showing a different facet of how nations and individuals face defeat. Gaud writes with a riveting immediacy, seamlessly taking the reader across the battlefields of our past to reflect upon the implications of conflicts being waged today.